Do you ever dream about retiring early? Billy and Akaisha Kadarli share their story of how they managed to retire early, at age 38. Billy, a Wall Street investor, realized he and his wife needed to pull back from work to help their marriage. Billy chronicles the steps he took towards early retirement and explains how he keeps his portfolio healthy. Learn about his market approach as well as his main sources of income. If you want to retire early, here are some good benchmarks to use. Ever wonder how the rich stay rich? The wealthy aren’t wealthy by accident. Billy and Akaisha Kaderli’s success in the brokerage and restaurant businesses gave them the opportunity to retire at the relatively young age of 38. 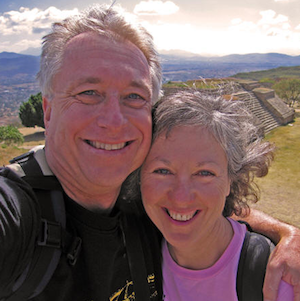 In this interview, the couple share their tips and insights on early retirement. Douglas Goldstein: I’m very excited to be talking to Billy and Akaisha Kaderli, who are in Guatemala right now. They retired there about a couple of decades ago. I guess the first question is, why did you retire so young? Why Did Billy and Akaisha Retire so Young? Akaisha Kaderli: Billy and I were working so many hours a week. We put in 60-, 80-hour work weeks, and we weren’t really seeing each other very much, and our relationship started to suffer. Billy came up with this idea that we could possibly retire on our investments and not have to work at all. Instead, we could travel the world. I thought it was a crackpot idea, but he was pretty convincing. We took about two years to plan it all out, and then yanked the chain and left. Douglas Goldstein: At that point, how many years were you married? Akaisha Kaderli: A dozen or 15. Douglas Goldstein: You knew by that time that he wasn’t actually a crackpot? Akaisha Kaderli: No, he’s a genius. He really is. Douglas Goldstein: Billy, you were actually a Wall Street guy. You knew about investing, and I’m trusting you still do know about investing. You were a branch manager for a major brokerage firm at the time. What were you thinking in terms of how you would structure your investments? What age was it that you retired? Billy Kaderli: We retired when we were 38 years old. Douglas Goldstein: How did you think you’d structure your investments to go from 38 till the end? Billy Kaderli: Right at the end of my career, I was learning about no-load mutual funds and low-expense index funds, so we started pouring everything we could into the S&P 500 at that time; the S&P 500 Index. This was in a mutual fund at that time. Today, there’s ETFs that I use, like SPY, that are just easier for me. I did a lot of projections on this and I figured out what we’d been making per year on the market, and I figured if we could live on 3% to 4% of that, and allow 3% to 4% of that for inflation, we were covered. Douglas Goldstein: That’s the total of 6% to 8% you thought you’d make in the market? Billy Kaderli: Pretty much so. On the day we retired, the S&P 500 closed at 312.49. Today what is it? 2400 and something; I don’t even know. It’s a 7.8% return annually, plus a couple percent for dividends, so we picked up at 10% per year just being in the S&P 500. Douglas Goldstein: You’re richer today than when you retired. How many years ago was that? Billy Kaderli: Yes, quite a bit more and much more financially stable, and that’s ahead of inflation and spending. Douglas Goldstein: When you started, you were 38? I’m a little bit older than 38 now, too, but I’ve seen a few crashes in the market. I wouldn’t be prepared to retire now. I would just say, “At this point, in order to retire at a young age, I need to put a lot of money into the stock market,” but I’d be afraid of a major collapse. How did you deal with that fear? Billy Kaderli: When I was working as a broker, I went through the 1987 crash and I saw how that came back. Also, since we retired, we’ve gone through the 1999 crash, the 2000 Y2K issues and then the 2008 and 2009 financial mess. You just got to kind of gut it up a bit; I’m getting better at gutting it up. It’s not easy, I can tell you that. I always looked at it as if there was a 50% correction in the market, could I still handle it? Could we survive? The answer has always been yes. That’s the way I looked at this thing, that I could handle a 50% drop and knowing that it’s not going to last down there, knowing that this is going to be a temporary situation. Now, “temporary” could be six months to a year. I don’t know. Douglas Goldstein: Or it could even be longer. No one knows. What was your asset allocation when you started? When you were young? Billy Kaderli: A hundred percent long in the S&P 500. Billy Kaderli: Today we’re about 60% long, and it’s a little bit more diversified. We own SPY, which is the S&P 500, ETFs, PTI, a DVY dividend play on the DOW, and a couple of other smaller positions. Douglas Goldstein: What’s the 40%? Billy Kaderli: We’re about 60% long right at the moment. I’d like to increase it. I, like everybody else, seem to be waiting for a dip. We haven’t had one, since February about a couple of years ago, and since then, the markets have gone up 34%. Douglas Goldstein: Got it. The 40% that you’ve got is that you’re sitting in cash waiting to be deployed? Billy Kaderli: I’m nervous about the bonds market; the Fed is raising interest rates, so I’ve got a preferred ETF called a PFF, and it pays around 6%. It pays monthly - not 6% a month, but 6% annually. My point is that I’m using that as a money market substitute for the time being, but I’m ready to pull the trigger on that thing as soon as I see some trouble, like, if the Fed starts raising rates too fast. So far, they’ve telegraphed everything and the market’s been able to absorb them, so I’m watching to increase our equity exposure at some point. Douglas Goldstein: You retired and put all your money into the stock market. I guess you had a big prayer and hoped it would work out. Then what did you do? What was the next thing you did the next day? Billy Kaderli: The next day we went to Nevis, West Indies, in the Caribbean. I don’t know if you’ve ever been to the Caribbean, but it’s a very laid back, slow-living, slow-moving place. I wanted to go someplace where I’d hit a wall. I didn’t want to be tempted or to get back into the business, because I’ve seen other guys retire and then six months later they’re being asked to do something else, and I didn’t want that. I wanted to go down and live the island life, so we lived six months on Nevis. I always had a saying that on Nevis, if you want to order a hamburger today, you’d better order it yesterday because that’s how slow it is. Douglas Goldstein: That is very slow. Let’s talk about other things that are slow, because you mentioned something before, in terms of interest rates. You said you think that they may be pushed up a little bit by the Fed, sort of in a slow but announced way, meaning the Fed is announcing their intentions and then they’re doing it. As such, you mentioned that you were happy to have money in a preferred stock fund. You mentioned a PFF. A preferred stock fund normally acts very much like a long-term bond fund in terms of how it reacts to interest rates. First off, can you explain that and then explain why you’re not really worried about that? Billy Kaderli: Well, I didn’t say I wasn’t worried about it. Douglas Goldstein: Well, why don’t you say that now? Billy Kaderli: It does act like a long-term bond and that’s why I’m concerned about it, but we were sitting in cash for a while and I was looking for some money market substitute, and I discovered the CTF and the PFF. Since it pays on a monthly basis, there’s cash-flow. So I thought I would give that a shot to put a portion of our cash investments into it. I monitor it every day and if it starts to slide, I’ll be happy to get out. For the year so far, I don’t know, I’m up about 5% or 6% in it, so that’s the dividend plus the game. Douglas Goldstein: You’re just saying it’s a “so far so good model” and you’re prepared to jump ship as soon as it no longer looks good to you? Billy Kaderli: On that position yes. On our index funds no, I wouldn’t touch them. Douglas Goldstein: Those are just for long-term and you get some dividends out of it. Do you use only dividend income now to live, or do you also look at the total return and you might sell off positions in order to raise capital to cover expenses? Billy Kaderli: We used to sell off positions from the total return, but as we’ve aged (we’re 65 now) we’re drawing Social Security. Between dividends and Social Security we make up more than enough of our spending. Douglas Goldstein: How much do you get for Social Security since you didn’t actually work till 65 like most people do? Billy Kaderli: Well, the U.S. rules for Social Security are that you need 40 quarters, so if you worked for 40 quarters, then you make $600 in a quarter or something like that. You qualify for Social Security. Douglas Goldstein: Are you just making the minimum amount? Billy Kaderli: No, because I made a pretty good salary. In the case where you make a pretty good salary, I don’t know if we’re average or above average, or what it is, but we don’t make the maximum that people make today. Billy Kaderli: We stopped working 26 years ago. Douglas Goldstein: Yes. At the moment, your two income sources are Social Security and drawing dividends from your portfolio? We even wrote a piece on our website. I came up with this idea on how to double your Social Security, and that’s by buying dividend growth stocks so that your dividends can match your Social Security payment. Now, all of a sudden, you’ve got twice as much Social Security coming in. If you start this when you’re young and dividend in your investments, you can amass quite a dividend portfolio. Douglas Goldstein: Have you met someone today who’s 38 years old who said, “You know, I’ve been thinking of doing what you did”? You would presumably ask him, “Well, how much money do you have?” because that would be the test to see whether he could actually retire. How much money do you think someone, a 38-year-old today, would need to retire and then live like you for the rest of his life? Billy Kaderli: I would say very comfortably on a million. We did it with half of that, but that was, like I said, many years ago. Almost three decades ago now. Douglas Goldstein: You’ve been living outside the United States the whole time? Billy Kaderli: No, we have a residence in Arizona. Douglas Goldstein: Oh, no kidding. How much time do you spend in the U.S.? I apologize because all along I was thinking this whole model works if you’re willing to move to a really low-priced jurisdiction, but that’s not the case. Billy Kaderli: Well, yes and no. It works better in this type of situation. We’ve spent a lot of time in Thailand, Vietnam, Mexico, and Guatemala in the last few years. Douglas Goldstein: Can someone do this in America if someone doesn’t actually want to leave? Billy Kaderli: Yes, for sure. We know people who are doing it. Akaisha Kaderli: In Arizona, and the situation that we were living there was one of our lower costs of living for the year. We live in an active adult community; it’s a resort and so we had social outlets, swimming pools, and workout rooms, and that sort of thing. We own our little manufactured home, and food prices are good and all that sort of thing. It was one of our lower prices of living anywhere in the world. Douglas Goldstein: When you’re travelling and overseeing this, do you have to spend a lot of time dealing with your investments or it’s just set on autopilot? You have your 60, 40 split. If something changes, you’ll make an adjustment and then you just get on with your life? Billy Kaderli: The short answer is no, because I was in the business, as you know, and so it’s a hobby to me. Billy Kaderli: I like to stay abreast of what’s going on, because in the morning I have coffee with guys and we all BS about everything. I try to steer conversations to financial, and it really surprises me how poorly educated these guys are. They are international. They’re Australians, Germans, Dutch, Americans, and Canadians. It just surprises me how little financial literacy they have. Billy Kaderli: Luckily, they’re where they are. Douglas Goldstein: Yes, I wanted to say luckily, there’s a way for them to learn about it. In the last few seconds, tell us how can people follow you and follow your work? Billy Kaderli: From my website www.retireearlylifestyle.com. We answer all correspondence as soon as we can get to it, and we have a free newsletter that you can subscribe to. That’s right on our homepage. Feel free to drop us a line. We’d be happy to help in any way we can. Douglas Goldstein: Billy and Arkaisha Kaderli, thanks so much for taking the time. Billy Kaderli: Thank you Doug.